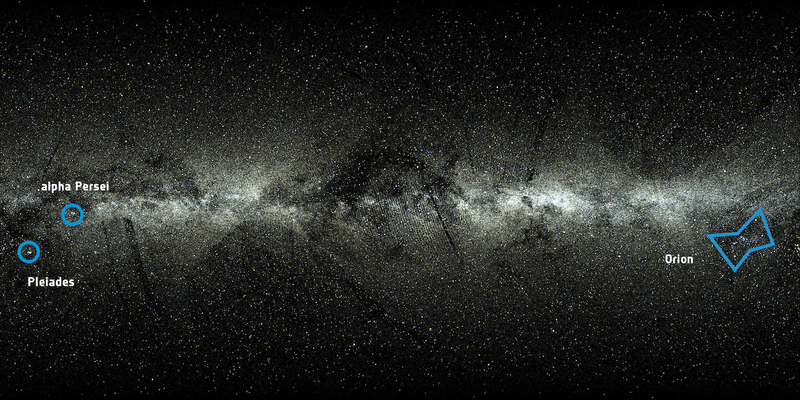 An all-sky view of the 2 057 050 stars from the Tycho-Gaia Astrometric Solution (TGAS), one of the products of the first data release from ESA's Gaia mission. TGAS lists positions, distances and proper motions for stars in common between Gaia's first year and the earlier Hipparcos and Tycho-2 Catalogues, both derived from ESA's Hipparcos mission, which charted the sky more than two decades ago. The view also includes 24 320 bright stars from the Hipparcos Catalogue that are not included in Gaia's first data release. The stars are plotted in Galactic coordinates and using a rectangular projection: in this, the plane of the Milky Way stands out as the horizontal band with greater density of stars. The shape of the Orion constellation is highlighted towards the right edge of the frame, just below the Galactic Plane. Two stellar clusters can be seen towards the left edge of the frame: these are the alpha Persei (Per OB3) and Pleiades open clusters. In this view, brighter stars are shown as larger circles, and an indication of the true colour of each star is also provided; information about brightness and colour is based on the Tycho-2 catalogue from the Hipparcos mission. The stripes visible in the image reflect the way Gaia scans the sky and the preliminary nature of the first data release.